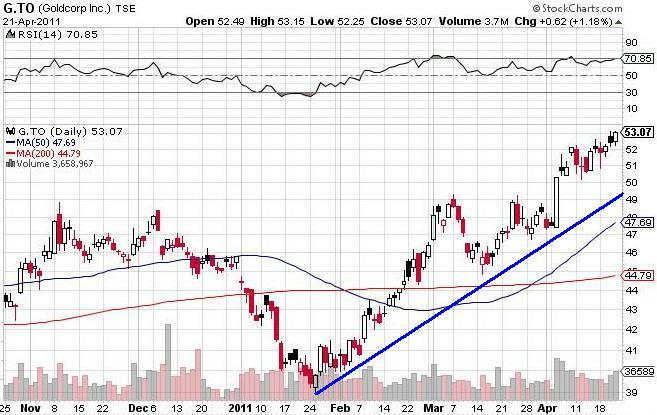 Gold and silver are making new highs, so why aren’t gold and silver stocks making new highs? $53 is a new multi-year high. Historically Goldcorp is into overbought territory, which is why I have sell orders for some of my holdings as the price continues to increase. 1 It’s the hedge funds. I’m stealing this from Trader Dan Norcini, who explains it perfectly in his post on why Hedge Fund Ratio Spread Trades Continue to Distort the Value of the Mining Shares. I suggest you read his entire post, but in summary here’s the idea: in the past, there were two ways to play rising precious metals prices: you could play the commodities futures market, or you could buy mining shares. 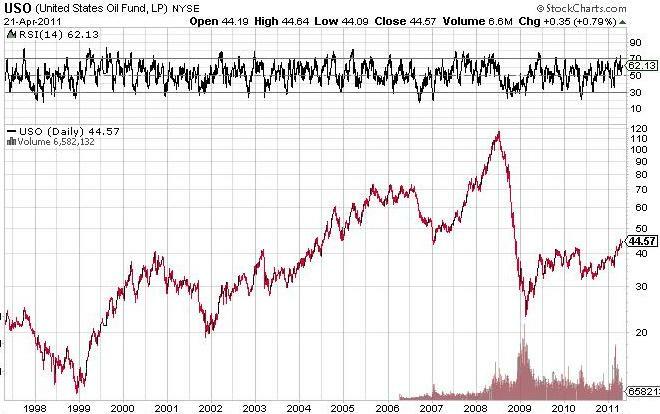 Since most mutual funds don’t play commodities, the money went into mining shares. Today hedge funds are big players, and they can invest in whatever they want, so they buy futures, but they also hedge their bets by shorting the mining stocks. Mining stocks tend to be more levered that the underlying metal, so a drop of 1% in the metal may imply a drop of 1.1% in a stock. That’s a way to mitigate risk. 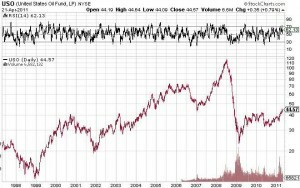 Shorting by hedge funds could explain depressed stock prices. Of course, that will only be a temporary phenomenon. 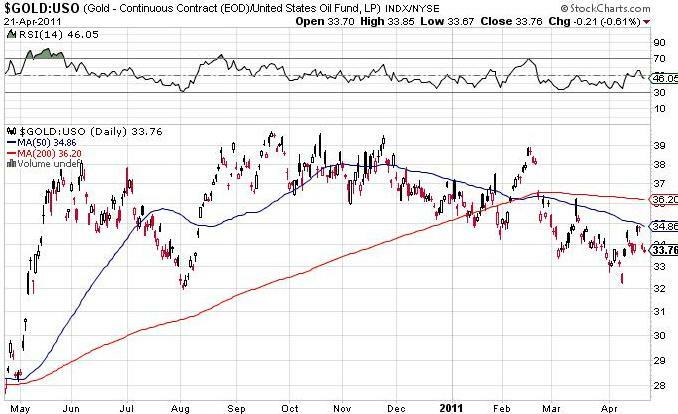 At some point the shares become so depressed that the trade switches back to the shares, and off they go. But in the short term, that explanation may be reasonable. 2 The markets are manipulated. I have no proof or evidence of this. 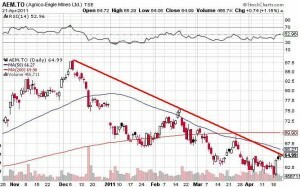 However, if you wanted to slow down the rise in precious metals, and you had the power, I guess you could short or sell the mining stocks, and move that money into physical precious metals. It could also be that with options settlement day last week, someone wanted to hammer the share prices so that more options would expire worthless, saving them some money. (Yes, I understand that it’s not a perfect comparison, but you get the picture). 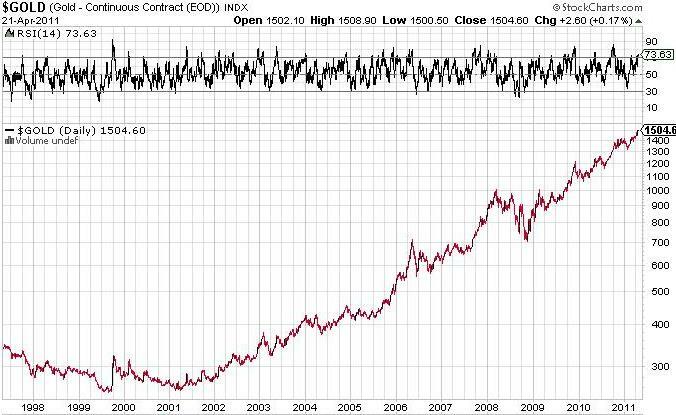 Obviously gold is on a long term bull run. If you squint, you can see a minor correction at the end of 2008, but it’s largely an “onward and upward” chart. 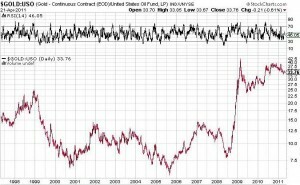 The collapse in oil prices in late 2008 led to a spike in the price of gold, measured in units of oil. The inverse is also true, as over the last month or two the increase in the price of oil has weakened the price of gold, measured in units of oil. 4 The price of gold is measured in U.S. dollars, but many of the gold mining companies are in Canada, or are Canadian companies. They pay their operating expenses (for workers, fuel, equipment, etc.) 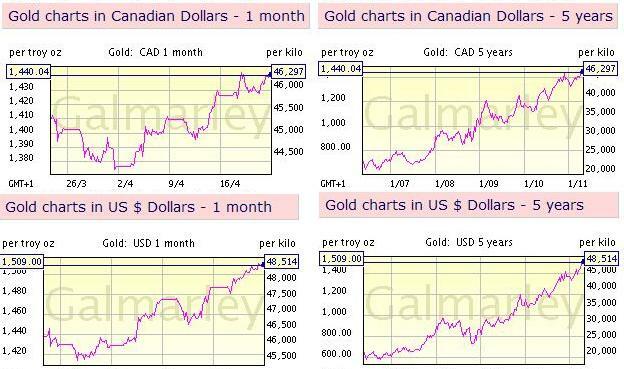 in Canadian dollars, but sell their output (gold) in U.S. dollars. As the Canadian dollar has strengthened against the U.S. dollar (it’s now about 5 cents above parity, as compared to 40 cents below parity a few years ago), their costs have increased faster than their revenue, in Canadian dollar terms. In the last month the price of gold in U.S. dollars has increased from $1,440 to $1,509, an increase of about 4.8%. In Canadian dollars the increase from $1,410 to $1,440 is only a 2.1% increase. That’s a huge difference. 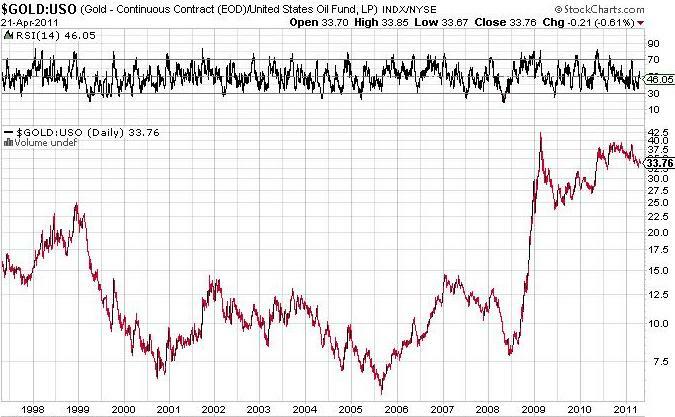 (As an aside, that’s good evidence that the U.S. dollar is in big, big trouble. We are witnessing the collapse of the world’s most powerful currency, proving that you can’t print money like drunken sailors forever and not suffer the consequences). You would expect that this chart would be a horizontal line, assuming that gold mining shares and the price of gold would move together. Obviously they don’t. First, a mining share investor invests for leverage, hoping that an increase of 1% in the price of gold leads to a 2% or more increase in the share price. Why? 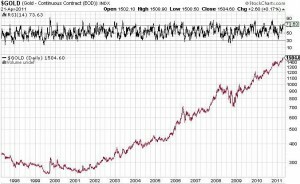 Because mining costs are relatively fixed, so any increase in the price of gold goes straight to the bottom line. For a bullion investor, a 1% increase in price is a 1% increase. That’s it. Of course the opposite can also be true, so there’s less risk to the downside for the bullion investor as well, due to no leverage (if they paid cash for their gold bars). Second, a mining share investor is willing to tolerate greater risk, for greater returns. 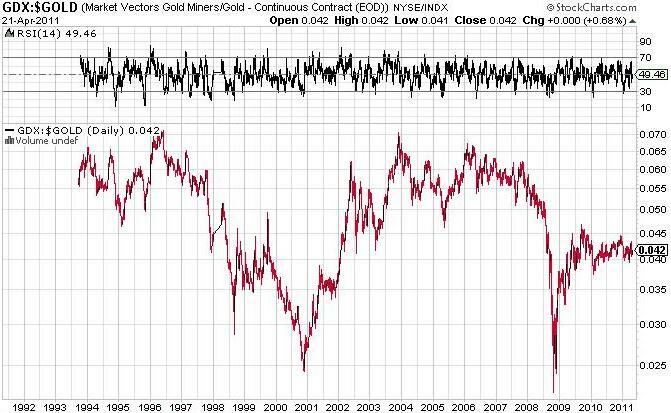 If the search for gold yields nothing, the share price drops to zero. If they strike a rich vein, the share price can quadruple overnight. High risk, high reward. There is no exploration risk if you own bullion; it’s already above ground. Let’s not also forget that there is seasonality to the stock market, epitomized by the old axiom to sell in May and go away. 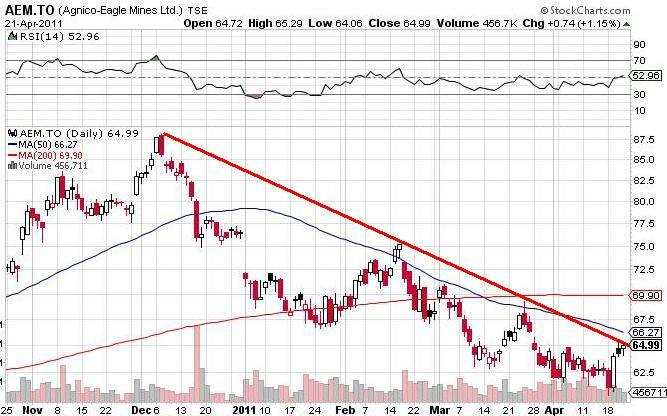 If you expect a correction, even a short term correction, you sell your gold mining shares. 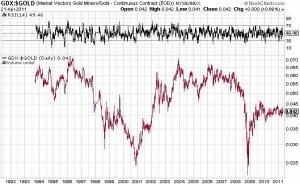 That seasonality may have nothing to do with the underlying price of gold bullion. So, what does this all mean? It means that in the short term there are many reasons why the price of precious metals may increase, while the price of mining shares remain flat, or decreases, or increases at a slower rate than bullion prices. However, these anomalies cannot exist forever. At some point investors take advantage of the arbitrage opportunity, and shift from bullion to shares. 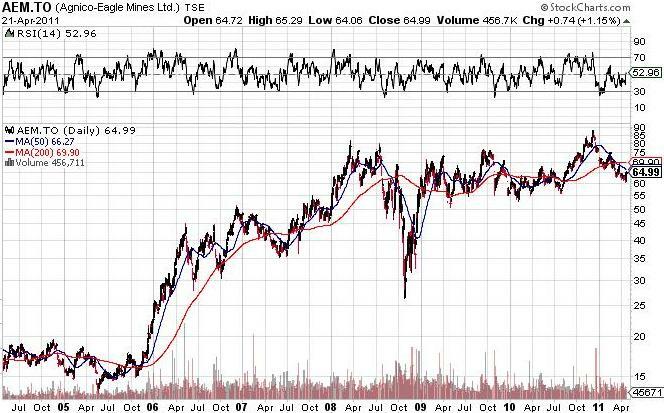 Also, if share prices get cheap enough, there will be a wave of mergers and consolidations in the mining industry, as inexpensive companies are snapped up for cents on the dollar. How am I playing it? In the long term, I’m all in. I strongly believe that when we look back six, or twelve or twenty months from now, we will marvel at the bargains available in bullion and gold and silver mining shares. However, in the short term, anything can happen. 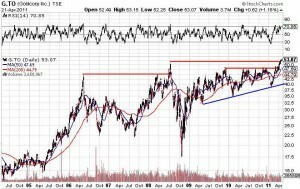 A consolidation, or a big smack down by the Big Boys could happen at any time. 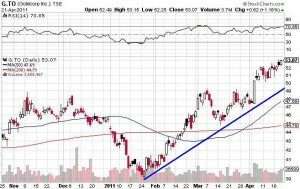 The cartel is still short, so an engineered sell off to help them cover their short positions would not be a surprise. It may therefore be prudent to raise cash in the short term, while still maintaining a core position, and load up on the inevitable corrections.